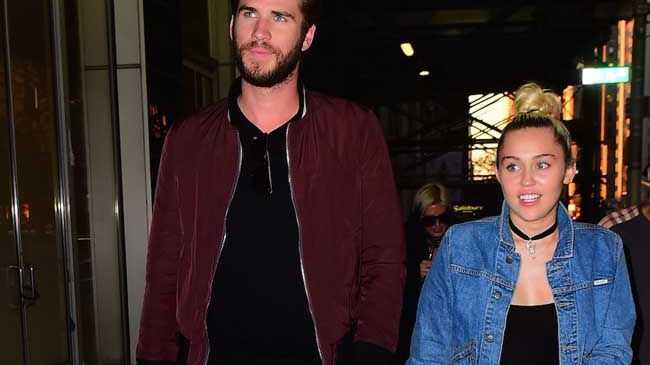 MILEY Cyrus has confirmed she and Liam Hemsworth are engaged - but she doesn't always wear her ring. The 'Wrecking Ball' hitmaker and the 'Hunger Games' hunk called off their first engagement in September 2013 bringing an end to their near four-year romance. They pair officially reunited in March this year and although Miley, 23, has been spotted wearing a huge diamond sparkler on her ring finger neither her nor Liam, 26, would confirm they were betrothed once again. However, Miley has admitted they are back on to wed during an appearance on 'The Ellen DeGeneres Show', but confessed the ring is too bling for her and she sometimes swaps it for costume jewellery. Ellen said: "There is a photo that got a lot of attention of your engagement ring. Congratulations." Miley then responded by saying: "This is really weird because this is like real jewellery and most of my jewellery is made out of gummy bears and cotton candy and they don't look that good together because they kind of mix up, so sometimes I replace it with an actual unicorn or a Looney Tune. Ellen then quipped: "He could have saved a lot of money by giving you like a gummy bear ring!"